John Adair is one of the world’s leading authorities on leadership and leadership development. Over a million managers worldwide have taken part in the Action-Centred Leadership programmes he pioneered. John has had a colourful early career. He served as a platoon commander in the Scots Guards in Egypt, and then became the only national serviceman to serve in the Arab Legion, where he became adjutant of a Bedouin regiment. After national service he qualified as a deckhand in Hull and worked on an arctic trawler in Iceland waters. He then worked as a hospital orderly in the operating theatre of a hospital. 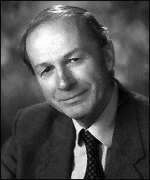 After being senior lecturer in military history and adviser in leadership training at the Royal Military Academy Sandhurst, and Associate Director of The Industrial Society, in 1979 John became the world’s first Professor of Leadership Studies at the University of Surrey. Between 1981 and 1986 John worked with Sir John Harvey-Jones at ICI introducing a leadership development strategy that helped to change the loss-making, bureaucratic giant into the first British company to make a billion pounds profit. John has written over 40 books, translated into many languages. Recent titles include 'How to Grow Leaders' and 'Effective Leadership Development'. Apart from being an author he is also a teacher and consultant. From St Paul’s School he won a scholarship to Cambridge University. John holds the higher degrees of Master of Letters from Oxford University and Doctor of Philosophy from King’s College London, and he is also a Fellow of the Royal Historical Society. Recently the People’s Republic of China awarded him the title of Honorary Professor in recognition of his 'outstanding research and contribution in the field of Leadership'. In 2009, John was appointed Chair of Leadership Studies United Nations System Staff College in Turin.